Jayashree sent photos of a gorgeous project she has recently finished – a beautiful hand embroidered Indian sari, worked in vivid colors on a silk ground. I think you’ll agree it’s really gorgeous! The embroidery technique used on Jayashree’s sari is called Kasuthi. 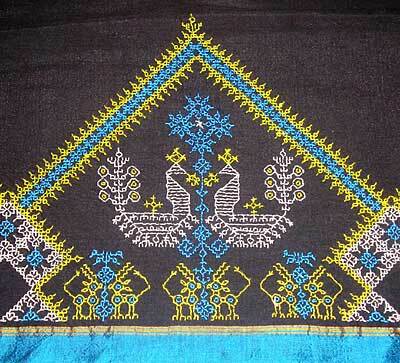 It’s a technique that originated in the Hubli Dharwad region in North Karnataka around a thousand years ago, and is quite similar to blackwork. 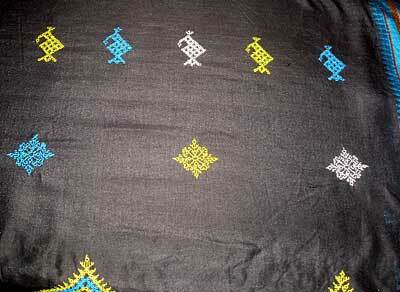 The geometric designs embroidered on the dark silk in vivid colors are stunning! The sari is 5.5 meters long and 45 inches wide, with designs embroidered all over it. The entire sari, including the pallu (scarf portion) has 125 motifs worked over it! 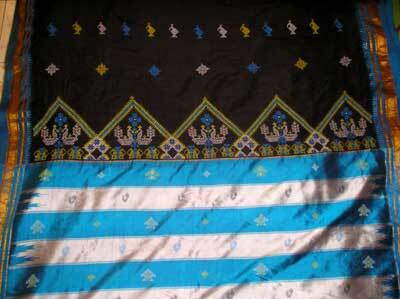 You can see here the intricacy of the main motif, repeated above the striped area – imagine (I can’t!) the time and diligence involved in adorning the magnificent piece of silk. I love the gold edges, too, which are just visible on the outside edges of the photo. The striped area is really stunning – a magnificent display of color! Here, you can see closer up some of the individual motifs. The embroidery is worked without a hoop, over net, so that the individual fabric threads in the ground fabric are not counted. A maximum of four colors are used in the embroidery, and only four stitches: double running stitch (also called Holbein stitch), cross stitch, diagonal stitch, and weaving stitch. And, finally, most amazingly – the work is reversible, so that the image on the back is as clear as the image on the front. Jayashree has put the instructions for working Kasuthi embroidery on the IndusLadies forum, if you would like to check them out. You must be registered to view the attachments. Beautiful, isn’t it? What a superb piece of clothing! Thanks, Jayashree, for sending along the pictures! If you’d like to share your embroidery with Needle ‘n Thread readers, please don’t hesitate to contact me! It’s always a pleasure to see what people all around the world are doing with their needle & thread! jayshree’s work is really nice. I belong to the region where this embriodery orginates and I am feeling so proud seeing the work from my region on your blog. I have learnt this embroidery techinque from my aunt. This is really beautiful! thank you both for sharing it with us! What a stunning piece of work! I love the precision. Well done! Actually, I can answer that for you! She made it for her son’s valedictory function, and it took her exactly one month to make it! WOW!!! Thank you, Mary for making it possible for your readers to see Kasuthi from India. Thanks to Deepthi, Verobirdie, Margaret, Anneg and Mary for all the appreciative and encouraging words. This makes me want to plan another type of Indian embroidery on a sari. This is truly stunning! Stitched in only a month?!?!?!?!?? Was in for a surprise when i clicked the mail from Needle’n’Thread.You have made the fraternity from INDIA proud by posting this saree work-Kasuthi.Congratulations and Wishing to see more works from you in Here! Thank you MJ and Jayashree. Kasuthi is so much like Blackwork and this shows that art has no real boundries. It’s a beauty! And only in a month???!!!! am proud to say that the creator of this sari is my friend! kudos to you jayashree, you managed to finish the whole sari in a month!! Am also feeling inspired to start a sari with kantha/ kutch / kasuti work! keep creating more masterpieces like this! Kasuti is a behoder’s delight.Few will realise how taxing and strenuous to eyes and neck. As jayashree’s mother I can vouch for her determination to complete a job once she is at it. So one month deadline is not new to her as she has made one saree for me in a month when she was pregnant without my knowledge as soon as she learnt Kasuti. Jai keep it up without straining too much. Awesome!! I could not believe this intricate stuff could be hand embroidered until I actually saw the saree. The finish calls for an eye for the smallest details be it the colours or patterns; all of which are truly amazing! hats off .But still India has many more works like this which is not brought into light.We also see a master piece called kaudige if Iam correct which is a patch work with bits of sarees and bedspreads made into shawl .Kasuti work is done all over the saree blouse to cover the entire area. Congratulations! You have done a great job. Even I was a student of Mrs. Mridula’s workshop conducted in Bangalore 10 yrs ago. 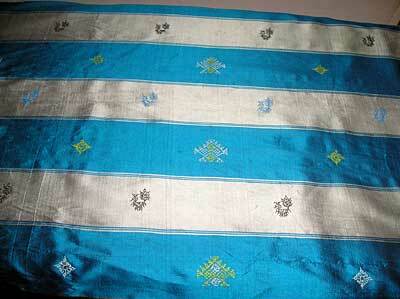 I am a big fan of Kasuti and I have done few works on Sarees and Kurthis. I am not able to get the design books of kasuthi. So can you please guide me where can I get the books. Hi this is muggulu… I belong to the region where this embriodery orginates and I am feeling so proud seeing the work from my region on your blog. I have learnt this embroidery techinque from my aunt. Hats off to your wonderful piece of work! Hi, its really nice jod.I am passionate about Kasuti, as this is purly geometrical craft.Kasuti will not allow you to go wrong at any step.